Welcome to my spreadsheets of car / track / event data in the Forza Motorsport and Forza Horizon series of games on Xbox/Win10. I use the spreadsheets to compare car specs and event eligibility, and track all Forza news. These are Google Drive docs and are free to view and download for everyone. Visitors can sort and filter a sheet online by selecting the Data menu > Filter Views > Create Temp Filter. Click the game name/pic below to go to its spreadsheet. Follow me on Twitter @ManteoMax for update announcements and subscribe to my Automotive and Gaming list of sources I use with Tweetdeck to monitor Forza and racing news. (See also the Twitter widget at the bottom of this webpage). I also have a Facebook Page with pics and events, and a YouTube playlist of 650+ official videos about Forza over the last 10 years. FH4 annnouncements, ForzaRC, FM7/FH3 Forzathons, and real world racing and Xbox events. Click the dropdown arrow in the upper right corner to show or hide individual calendars. Automotive (blue) - Major real world motorsport, tv, autoshows, expos, FM.net articles. A text version of 2018 racing/expos is on the FM.net forums. Forza 7 (black) - FM7 contests, DLC, and new events, and all past FM articles. Horizon (brown) - FH4 and previous Horizon DLC, events, contests, and articles. 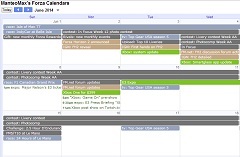 Xbox/Gaming (green) - Xbox One console updates and gaming expos where Forza news might appear. Click each event and "more details" to see a source link and overview. Displayed in Pacific Time zone. Work in progress. See Forums for discussion. September 28, 2018 Early Access. Cars - Announced cars with previous game roster cars, specs and engine swaps TBD. Links - Official announcements, third party articles/video, Preorder/DLC, forum links. Achievements - Complete list of launch Achievements, to be updated with Expansions. Outfits/Emotes - Checklist of collectible apparel and character customization. Songs - Complete list of game radio channels and songs, with Spotify playlist link. Plus: Properties and discovery areas, Car Mastery and Perks, Forzathon Shop, My Horizon Life levels, Rims, Event restrictions, and more to be added in September. Updating weekly. See the Forums for FAQ. Links - Official announcements and third party articles about FH7, with forum links. Cars - Exclusives status, DLC, Divisions, Tiers, specs, engine swaps, and all past cars. Events - Homologation restrictions, Forza Driver's Cup, Rivals, and Multiplayer lobbies. Achievements - Requirement details, links to Xbox images, and Forzathon challenges. Driver Gear - Group, rarity, and DLC/award notes. Mods - Descriptions, rarity, uses, CR and XP payouts (WIP). Rims - List of all 170 rims, descriptions and their relative weight classes and costs. Tracks - Locations, day/night/wet ribbons and lengths, comparison to real world racing. Updated with final DLC and ongoing Forzathons. FAQ on forums. Links - Official announcements and third party articles about FH3. Cars - Autoshow, DLC, Barn Finds, Midnight Battle, Horizon Promo, all prior car rosters. Achievements - Main and Expansion achievements, Forzathon challenges, links to images. Events - Exhibitions and Championships, Bucket Lists, Rivals details and restrictions. Skill Shop - List of Skills and the Perks in the Skill Shop you can unlock with skill points. Rims - List of rims and their relative weight classes and costs. Car Horns - List of car horn options and unlock requirements updated 12/13/16. Premium Edition with track DLC released Nov. 7, 2016. FAQ on forums. Apex is a free slim version (with premium option) of FM6 for Win10 with fewer cars and tracks. Links - Official announcements and third party articles about Apex. Cars - Apex models listed along with comparison to FM6|FH2|FM5|FH|FM4|FM3|FM2|FM1 cars. Events - Showcase event details and any others that appear in the game. Tracks - Locations and lengths for each track in the game. Achievements - Details and requirements for Achievements. Last updated with ForzaRC S3 recaps. FAQ on forums. Links & News - Links to official announcements, DLC, forum posts, and third party news. Cars - Lists all FM6 cars including DLC, with all prior Forza game cars. Events - Career, Rivals, and Multiplayer event restrictions and tracks. Mods - Main and Porsche and NASCAR additions. Rarity, sell value, and description of benefits. Tracks - Lists all track environments (with VIR and Homestead DLC), night/weather, ribbon names/lengths. Achievements & Badges - Lists names/requirements/points and Badges (with Porsche and NASCAR). World racing tracks - Lists FM6 tracks compared to FM5, FM4, and 150+ real world tracks. Features - Areas of interest that are in or excluded from FM6, with source links. Standalone game released March 27, 2015, counts toward Forza Rewards points. Cars - List of of car models (360, Xbox One, and traffic cars) and DLC packs, car types, and engine swaps. Rivals & Bucket Lists - Monthly Rivals event details, Rivals route list, Bucket List details and locations. Achievements - 50 Achievements worth 1000 points with Xbox One and 360 version comparison. Challenges added. Skills - List of known driving Skills. Links - Links to News articles and videos from FM.net and external sources, with a brief summary of each. DLC reached end of life Sept. 2018. Forza Rewards still active. Championships - Lists championship events with route name and race type (plus my leaderboard times in each class). Skills & Perks - List of known driving Skills and the Perks they can unlock, with Skill points required. Rims - List of all available rim upgrade options with weight and cost. Versions & DLC Chart - 360 vs Xbox One vs Deluxe vs Ultimate, and VIP, Car Pass, Storm Island DLC add-ons. Setups and Paint tabs - For tracking your own settings. DLC reached end of life Oct. 2017. Forza Rewards are still active. Events - Restrictions and tracks for Career races, Multiplayer lobbies, and Rivals, updated monthly. Titles and Achievements - Names and requirements for each, updated with new Challenges. Track Leaderboards - All tracks listed for each class with distance and times for average speeds per track. Links - Links to News articles from FM.net as well as related links to external sources. Rims List - Prices and relative weights for each rim make and model in the Upgrade Shop. Setups - Highest horsepower (fully upgraded) engines in the game with columns for recording details of your own setups. Edition/DLC Chart - A visual guide to what's included with each game version and DLC add-on. Released 2012 on Xbox 360, backward compatible on Xbox One Sept. 2016. DLC EOL Oct. 2016. Cars - Stock PI, price, DLC pack, Event Award cars, ratings and physical specs, conversion options, Body/Family styles, Min/Max PI. Events - Rivals and in-game Event details with vehicle requirements and payouts, and track details. Locations - Lists of Speed Cameras, Outposts, Barns, and Signs, nearby with notable environment features. Skills - Names, requirements, and popularity points listed for each Skill and Combo. Achievements - Details and requirements for Achievements, including Rally and 1000 Club additions. Rims List - Weights, price, and style descriptions for wheel rim options. Setups - Highest horsepower engines plus fields to record your own tuning setups. Links - Links to DLC, news, contests, and helpful sites. Note: DLC is no longer on the marketplace for this title. Cars - Stock PI, price, DLC pack, Driver Award Level, physical specs, benchmarks, conversion options, Body/Family styles, Min/Max PI. Events - Vehicle restrictions for Event list, World Tour, and Rivals events, with bonus modifier payouts. Tracks - Events cross-indexed with tracks to help identify duplicates in World Tour and help with World Tourer achievement. Titles/Achievements - Requirements for titles/badges and Achievements cross-indexed with tracks. Links - Direct links to DLC, Forza contests, Week in Review articles, lists of in-game data, and helpful sites. Leaderboards - All #1 leaderboard times and cars for Circuit, Oval, Drag, and P2P, with average speed per track. AI Lap Times - Compare flying lap times run by A.I. drivers in stock vehicles. Forza Motorsport and Forza Horizon © Microsoft Corporation. "ManteoMax's Forza Spreadsheets" was created under Microsoft's "Game Content Usage Rules" using assets from Forza Motorsport and Forza Horzon franchises and it is not endorsed by or affiliated with Microsoft.